Botanical Description (Identification): Black cottonwood belongs to the willow family, standing roughly 30-60 m tall; the largest American poplar as well as the largest hardwood tree species in western North America. The trunk is relatively straight and typically branchless for at least half of its height with bark ranging from grey to brown (in more mature trees), hence the ‘black’ in the name, with deeply furrowed, flat ridges on older portions. The leaves on the black cottonwood typically vary in size (7-12 cm long; 3.5-7.5 cm thick), they alternate, are dark green on top and pale green on the bottom, and are typically found with whitish or brownish resin blotches. Male and female flowers are on separate trees. Fruit is essentially globular capsules .3-.4 cm, these capsules split in order to release the seeds; which are roughly .2 cm long and are accompanied by long, silky, white hair that is used to facilitate the transfer and spreading of seeds via wind. Current Distribution and Local Habitat(s): Black cottonwoods have a significant range extending from Alaska to Baja California Norte. Cottonwood can be found in the following types of sites: alluvial, riparian, and moist woods on mountain slopes, in elevations ranging from 0-2750 m. Black cottonwood trees are typically found West of the Rocky Mountains, surviving best in relatively moist nutrient rich environments, making flood plains or moist upland sites with sufficient light the most desirable habitats. This tree species is able to grow in a variety of different soil types as well. Black cottonwoods are typically unable to flourish if located in the shade of other species, hence the favourable floodplain or upland habitat. Therefore, black cottonwoods are predominantly found in sites deprived of other large tree species. 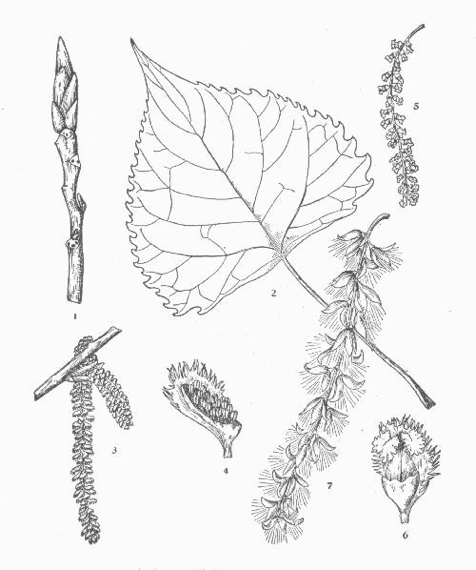 Ethnobotanical Application(s): Throughout history, black cottonwood has been valued as a commercially important tree. The light weight, fine, and evenly textured wood is one of the popular lumber types for the manufacturing of boxes and pallets. The fibres in the cottonwood are short and fine, perfect wood type for the production of paper products. The resin from the buds contain a substance with antibiotic properties called propolis and is used by many First Nations cultures; typically applied to the throat or mouth in order to soothe coughs, sore throats, and lung pain. This resin was also used as an adhesive in some cultures. The ‘cotton’ from the seeds was used to stuff pillows and was even spun with mountain goat wool in order to make strong fibre used in clothing. Along with these uses, the inner bark was sometimes used in the production of soap. Cottonwood has also frequently been used to make friction fire-starting kits found among many different First Nations cultures. The wood itself was also used for fuel in fires and specifically for smoking animal skins and fish meat. Overall, cottonwood was an important resource in First Nations cultures, utilised in many differing ways like for crafting wood, fire fuel, smoking fuel, medicinal sap, fibres from bark, and cotton from seedlings. UVic Campus Location(s): Black cottonwoods can be found in most quadrants of the University of Victoria campus. Notable locations include the Mystic Vale, moist areas along Bowker Creek, moist regions of the South Woods, Hobbs Creek, by the faculty club, as well as surrounding the law faculty buildings. Turner, N. J., & Turner, N. J. (1998). Plant technology of First Peoples in British Columbia. Vancouver: UBC Press. 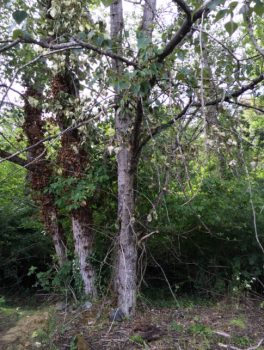 Plant Fact Sheet: Black Cottonwood, 2016.